Would you like to know how to use them for your business? Some of the recent Facebook features could have a huge impact on your business, including whether fans see your posts, as well as how you attract leads, track conversions and more. In this article you’ll discover how to use some of Facebook’s newest features to promote your business. 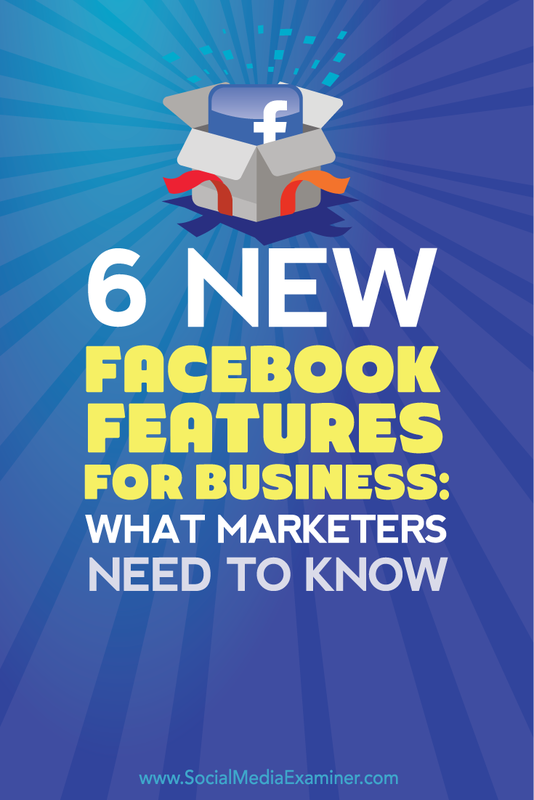 Discover what marketers need to know about six new Facebook features for business. Facebook now allows people to customize their news feed to prioritize updates from particular friends, groups and pages. This is great news for pages with good content, so fans can prioritize your posts. Educate your audience on how to select to see your posts first in their news feed. There are a couple of ways to access the See First option. The easiest way is to go directly to your Facebook page, click the Liked button and then select the See First option. The easiest way to access Facebook’s See First setting is on the page itself. Another option is to go to the full customization options (people, pages and groups) from desktop or mobile devices. To access it from a desktop, select the down arrow on the far right to get to News Feed Preferences. Select News Feed Preferences from your menu in the upper-right corner. Next, navigate down to Pages. Then view the pages you’ve seen most recently and click the tab to list the pages in alphabetical order. Click the Following button to customize those you want to see first. 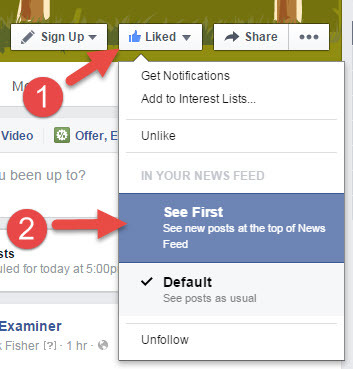 To customize your news feed preferences, click Following on the pages you want to see first. This video will walk you through the desktop and mobile customization process. When you have good content, people will want to see your Facebook business page posts in their news feed first. 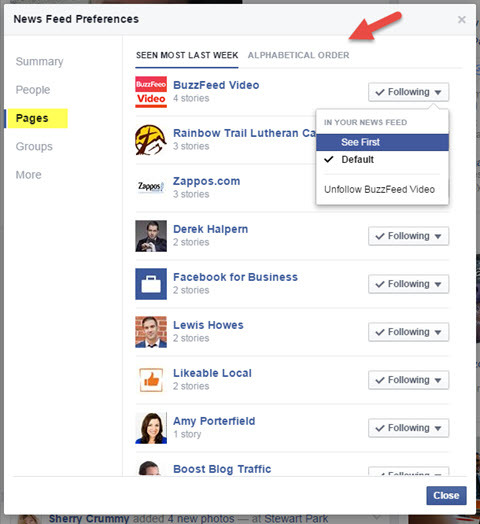 Tell fans how to add your page to their See First list, so you make sure they do. If you’re using website conversion ads or website retargeting, then you already know there are two types of pixels you place on your website to track these events and custom audiences. Facebook recently announced a new custom audience pixel that combines these features into one pixel, which will help with tracking and speed, so the stats are more accurate. Your current conversion pixels will continue to work, but eventually you should migrate to the new upgraded code. This involves placing the new code on your website, adding some code on specific pages you want to track and then removing the old pixels. 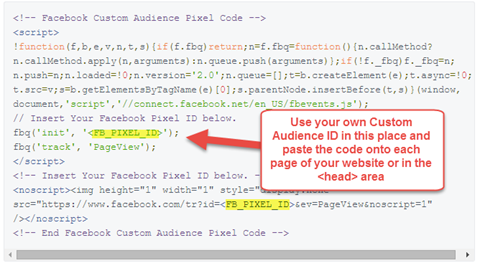 Facebook’s post explains the process and gives you the exact steps to change to the new custom audience pixel. The new pixel code will replace the previous one. It will be faster and more accurate. This is still in the rollout phase. Toward the end of Jon Loomer’s post about the upgraded pixel, he explains how to determine if your account has the new pixel enabled. Ultimately the upgraded pixel will be good for marketers who are using custom audiences and conversion pixels with their Facebook ads, since it gives more accurate stats in reports. The Facebook Beacon is a device you put in your local business that sends information to people who are on Facebook near you and have Bluetooth turned on. Send people a welcome message with a photo, recommendations from their friends who have visited the store, a prompt to check in and more. 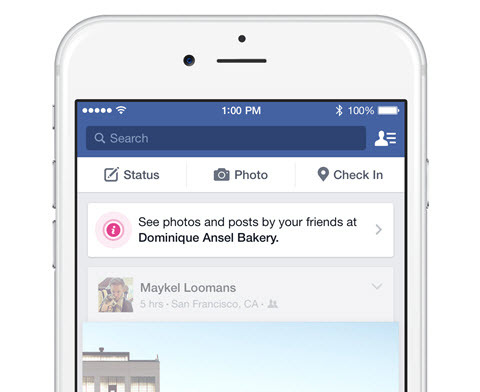 The Facebook Beacon boosts the visibility of your local business to nearby mobile users. The Beacon device is free. All you need to do is request one from Facebook for your local page. It’s an excellent way to increase the visibility of your local business to people who are using Facebook nearby. Earlier this year, Facebook started rolling out the ability to send money between friends through the Messenger app only to users in the United States. This service will rival Google Wallet and make it easier for people to make “in-app” purchases on Facebook in the future. In the meantime, if your friends are clients, they can pay you through the Messenger app. You can only use the Messenger mobile app with a debit card on file, not credit cards. Just click the dollar sign to get started. 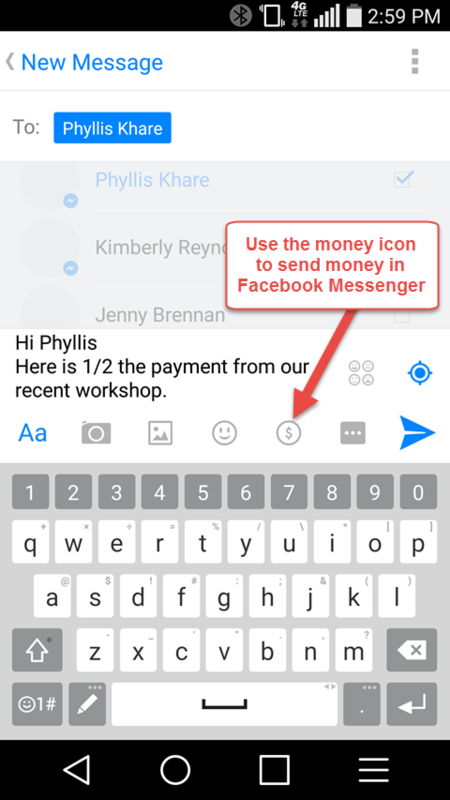 From Facebook Messenger you can send money to Facebook friends at no charge. You can also use the desktop version to send money, but the icon is a little more hidden. It only appears when you open the message outside of the inbox. The desktop Facebook app also allows you to send money. Facebook made this service available without a service charge, so there’s a benefit to using it over a service like PayPal, for example. However, as mentioned above, there are limitations: it’s only in the United States, you must be friends with the person and it’s debit card only. Saved Replies isn’t an earth-shattering change, but it can save precious time if you have a standard message you frequently send. Note: this feature is still rolling out. To access your saved replies, first navigate to the Messages area of your page. Access Saved Replies in the Messages area of your page. To see Saved Replies, click on a particular message. The message will appear in a pop-up box and the Saved Replies will be on the left sidebar. From there, select Manage Replies to see all of the replies you’ve created or create a new reply. You can even search replies by keyword. 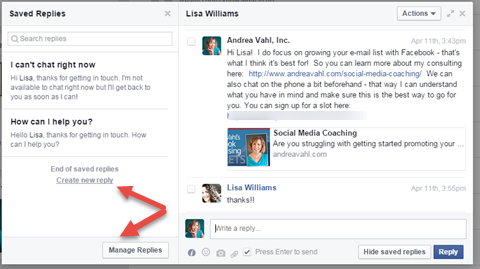 Click on the message on your Facebook page, then select Manage Replies or Create New Reply. Create generic replies for all of your frequently asked questions. Then customize them before sending them out. Save a reply that you use often to save you time, and then take a moment to customize it. 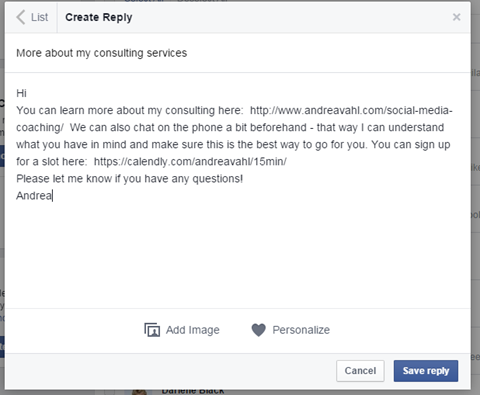 Any new saved reply will be available to you in your Facebook Messages area. This feature is currently only available for pages that have their Message button enabled. 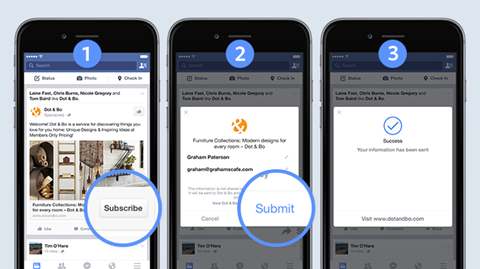 Facebook is testing new lead ads that make it easier than ever to fill in contact information on mobile devices. If mobile users respond to an ad for something like a newsletter, business information, free report or follow-up call, they can submit their contact information (email address or phone number) with just two taps of a button. Mobile users will easily be able to give you contact information. Currently lead ads are only available for select businesses in closed beta testing. Facebook is putting precautions in place to make sure this service isn’t abused. They are complying with the lead ads terms of service to ensure only page admins are able to export the .CSV with the lead information. We will keep you posted when this feature is available on a wider scale. 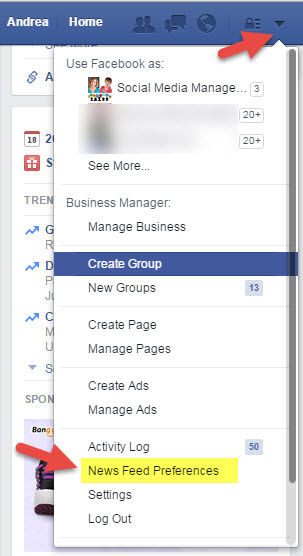 As marketers, it’s important to keep on top of all Facebook changes. While not all of these features have been rolled out yet, you can get a sense of what’s coming, as well as what trends may pop up in the future. Use these new features to increase your business’s visibility and better connect with your customers, as well as to spark ideas of how you can improve your business flow and your marketing. What do you think? What new Facebook features are you most excited about? Which ones are you already using? Share your thoughts with us in the comments below. 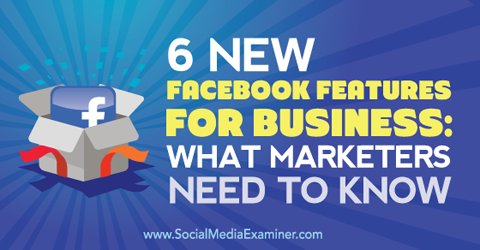 Tips for marketers to use six new Facebook features.